In episode 234 of the Podcast, we spoke to Simon Miller about his forthcoming English Civil War rules – For King and Parliament. TtS! 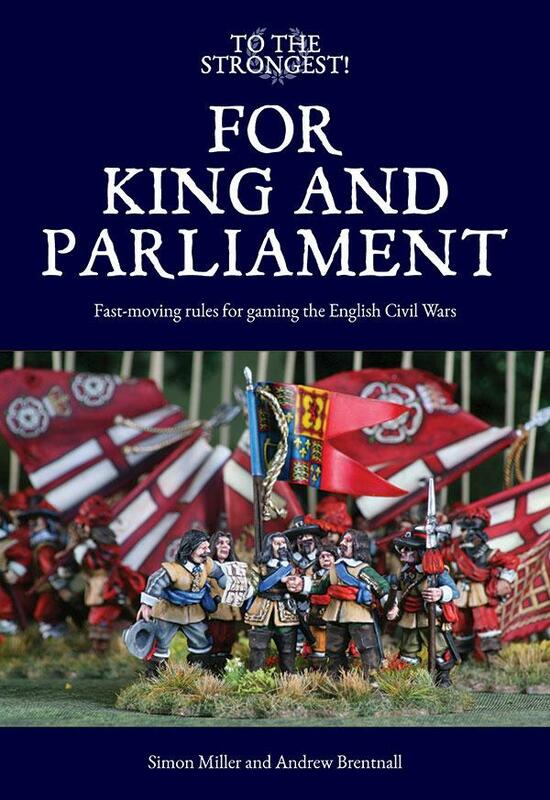 “For King and Parliament” is a simple set of wargames rules for the Civil Wars in England (and Scotland and Ireland) of the mid-Seventeenth Century. Written by Simon Miller and Andrew Brentnall, they use mechanisms that will be immediately familiar to players of the popular “To the Strongest!” ancient and medieval rules. Using For King and Parliament, a battle can be fought and won (or lost!) on a dining room table in less than two hours. The same rules, however, also support huge battles, involving thousands of miniatures and up to five players a side. The use of subtle grids dispenses with the need for measurement- and consequently play moves along at a cracking pace. A unique activation system driven by playing cards or numbered chits introduces uncertainty; in some turns a regiment will fly across the battlefield; in others it will stubbornly remain rooted to the spot. The same deck is used to swiftly resolve shooting and melee; no dice, whatsoever, need be rolled! Special rules model the various firing systems used by the foot, and the occasionally uncontrollable nature of ECW horse. The rules are written in plain English, and illustrated with appropriate diagrams, photographs and period images, sample army lists, examples of play and an introductory scenario. The rules are available as a book (£19.99) and as a digital download (£9.99), or together for £24.99. Along with various accessories, they are now for sale in the BigRedBatShop. We do hope you enjoy them – and may none of your cards be Aces! I have been toying with the idea of playing English Civil War for a number for years – with these rules I think I will finally take the plunge. Thanks Neil! Do please come and say hello at Salute GG07, meet Andrew and see my new ECW collection. It’s a wonderful period- I particularly love the innumerable flags which one can’t have in Ancients. …we have some of them in the book. Pendraken are nice in 10mm. In 28mm there’s bags of choice – I particularly like Bicorne but there’s also Foundry, Renegade, Redoubt, Perry, Empress, 1st Corps and the Warlord plastics and I’m sure there are more that I’ve missed. I don’t know the 15mm ranges.